Zone Jogging Track, Kertalangu Cultural Village has an area 4 km long jogging track in the form of cement line with a width of 2 m.
Zone Swimming Fishing, Culture Village Kertalangu has fishing ponds area for visitors who distribute his hobby and unwind while relaxing with family. Zone Industry and Handicrafts owned Cultural Village Kertalangu very diverse handicrafts made ceramics, candles, glass, garments, stone and glass products. Visitors can see the process of making up all the craft was completed. There is also a craft making various sculptures of sandstone as well as manufacture garden barrel of clay. There is also a carving workmanship Balinese house to be exported later. Zone Staging AttractionsArt and Culture, for staging arts and cultural attractions are a special stage. Arts and cultural attractions are staged at the Cultural Village Kertalangu is Kecak, Barong Dance, and Joged tube. Outbound Zone, outbound zone is owned rice fields of society has. Outbound activities to be undertaken by visitors is growing rice and catch eels. To grow rice tourists will be encouraged and taught how to plant rice was good and right by the farmers from the local community. Equestrian Zone, Cultural Village to offer for tourists who like to ride along while traveling around the region, so as to enjoy all the sights there. Travelers will be accompanied by trained instructors in the field so no need to worry if you've never rode though. Training Zone Spa, spa training zone Kertalangu Cultural Village offers visitors how to make soaps and spa products is good and right in accordance with the existing measure. Visitors will be given training by instructors with experience in the spa field. 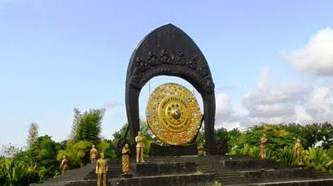 Culinary Tourism Zone, there are specific areas around Kertalangu Cultural Village which offers a culinary tour of Balinese food, snacks Balinese Balinese drinks, and a variety of other foods. The facilities are ownedby theCultural Village Cultural Village Kertalangu Kertalangu Kesiman are as follows: Pos parking areas and parking, Staging Points, Restaurants, Bale Bengong. Kertalangu cultural village is also a tourist village where you can vacation while fishing, learn to make crafts, horseback riding and culinary tour. So a time to yourself to relax in Kertalangu Cultural Village is a fitting place for a vacation with your family. 0 Response to "Kertalangu Cultural Village, Denpasar Tourism Destination"